I had leftover leaves of turnip, half package of “jako” (dry baby fish), and grated Parmigiano Reggiano, so I decided to make “onigiri” (rice balls) with these ingredients. The recipe is extremely simple. 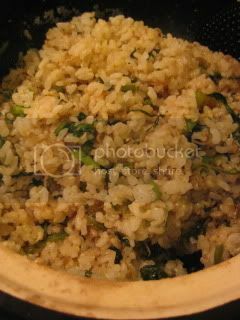 First, you make plain rice (2 rice cups) with double-lid donabe rice cooker, “Kamado-san”. Meanwhile, you sauté about 1 oz “ jako” (dry baby fish) in 1T sesame oil for a couple of minutes. 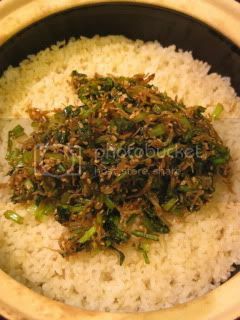 Addd about 1.5C minced turnip leaves and continue to sauté until the leaves are wilted. Add 1T sake, 1/2T mirin, and 1T soy sauce and simmer for a few minutes until there is very little liquid left. Add 2T sesame seeds and stir. Turn off the heat. Once the rice is ready, add the above mixture and 1/4C grated Parmigiano Reggiano and quickly mix with the rice. 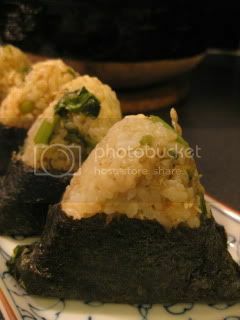 Make the rice mixture into triangle-shape “onigiri” (rice balls) and wrap each with nori. The flavor is really great. What a nice combination.